Halloween is near! Be sure to include the Paynesville library in your plans! 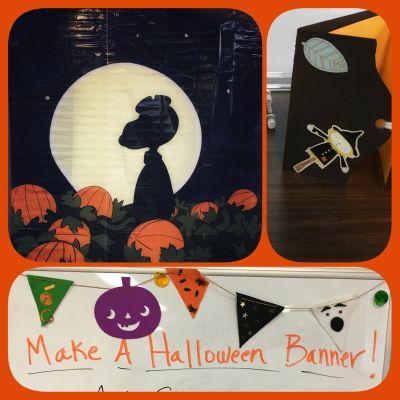 Crafters: We've got all the supplies you'll need to make a Halloween banner to decorate your door or window. It'd be great to welcome Trick or Treaters to your home. While supplies last, for ages 8 and up, during library open hours. We also have supplies and instructions to make a themed journal/notebook/notepad. Cute and useful! Our 'Great Pumpkin' photo booth is up again this year. You can snap a photo of you and your family, in your Halloween costumes, awaiting the Great Pumpkin. Perfect for sharing with family or on social media! If scary stories are your thing, don't miss 'Minnesota Spirits: Stories, Tales & Legends from Local Haunted Places" — Stories of real haunted Minnesota homes and places! This event is on Friday, October 27, 8 p.m. at the Paynesville Public Library. No preregistration required. For teens and up. And finally ... the Paynesville Library will have treats for Trick or Treating customers (in costume!) on Friday October 27 from 4:30-8 p.m., Saturday from 10 a.m. - 1 p.m. (hit the library first if you come downtown for PAYNESVILLE BUSINESSES TRICK OR TREAT DAY, because we close at 1 p.m.), and Monday and Tuesday, October 30 and 31 during open hours. Saturdays 10 a.m. - 1 p.m.